The Belgium playmaker is frustrated by the club’s failure to qualify for next season’s Champions League. Chelsea's Eden Hazard (file pic). EDEN HAZARD HAS warned Chelsea to sign players who will turn them into title contenders if they want him to commit his future to the club. But the Belgium playmaker is frustrated by Chelsea’s failure to qualify for next season’s Champions League and is reportedly a close-season target for Real Madrid and Paris Saint Germain. Asked what it would take to stay with Chelsea in the long-term, Hazard said: “I’m waiting for new players next season. We will see. 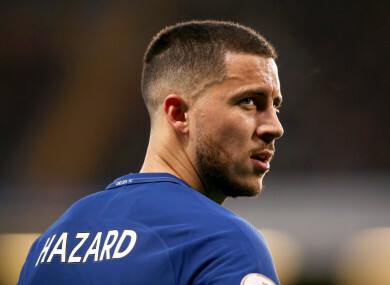 This would likely be Hazard’s last big contract and the midfielder has no intention of rushing his decision, despite reports that Chelsea are willing to pay him around £300,000 (€343,000) per week. “That’s why I’m taking my time. It’s something big. I need to think of a lot of things. One thing for sure is I’m happy here,” he said. Chelsea finished fifth in the Premier League, well adrift of champions Manchester City, after an inconsistent season marred their defence of the title. They also failed to win the Champions League and League Cup, leaving Saturday’s FA Cup final against Manchester United as their last chance of silverware this season. Hazard concedes Chelsea have under-performed, but he believes winning the Wembley showdown with United would at least salvage something from their disappointing season. To play Champions League next season is important. To win trophies also. We want to do it,” Hazard said. “We want to play Champions League next season and win trophies. That’s it. “So if we can’t have one, we need the other. We can’t be in the Champions League next season so we need to win trophies. That’s it. Hazard insists the uncertainty surrounding Chelsea manager Antonio Conte has had no impact on the squad. Conte is expected to leave at the end of the season after his feud with the club’s hierarchy over their failure to back his transfer plans. We don’t think about that. We’re just focused on the game,” Hazard said. If Chelsea can lift the FA Cup, then the Champions League will be the one major honour to elude Hazard during his time at Stamford Bridge. “I need two more trophies, Champions League and FA Cup. That’s it,” Hazard said. Chelsea face a familiar foe this weekend in United manager Jose Mourinho, who had two spells as Blues boss. Mourinho has been criticised for conservative tactics this season, but Hazard expects United to pose a stern test. “We know how he will play. We all know that. That’s why we need to be ready,” he said. Email “Hazard warns Chelsea to improve squad before he decides future”. Feedback on “Hazard warns Chelsea to improve squad before he decides future”.